Heads up: A Vos Spectacular. Danny Olinger is interviewed by Christ the Center and Iron Sharpens Iron about this very influential character named Geerhardus Vos. 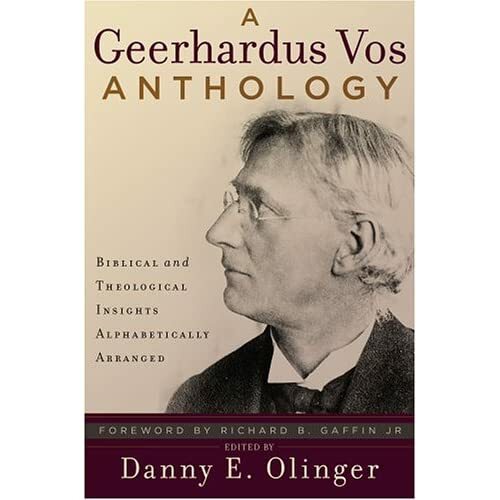 Olinger is the editor of a new book titled “Geerhardus Vos; An Anthology“. First up, the boys at Christ the Center provide a first rate interview with Olinger so that not only will you come away with some knowledge about who Vos is, you will also have a healthy grasp of some tremendous theology that should frame our lives and outlook on living in this world. Two heavy-weight doctrines emerge that were convictions of Vos. The first is summed up in the phrase, “Eschatology before Soteriology”. If we understand the fourfold state of humanity(pre-fall, fallen, redeemed, glorified,) Vos understood that Adam was not in his final state where he could not sin. God had an eschatology for Adam before the fall. Adam looked forward to a glorification. Olinger says that if we don’t understand this, then we shouldn’t waste our time reading Vos, because this is crucial. The second is that the biblical understanding of “practicality” is not the same as our human understanding of being “practical.” Practicality in Scripture means that we are driven to communion with God, that he becomes our highest goal and our supreme inheritance that we look forward to. If we understand that God is our inheritance, then we will not be sidetracked by seeking “higher purposes” that are fixed in this world which is passing away. If God is our inheritance, then we will have no trouble spending our lives for God’s Kingdom, and at that point we truly become salt and light in the world. One other interesting note is that Vos taught that Redemption and Revelation are bound up together. If God had not intended to redeem humanity then there would have been no need for Scripture. This is one interview that will truly enlarge your horizons to where Scripture is. Chris Arnzen on the Iron Sharpens Iron radio program asks Olinger why Vos has been labeled as “The Father of Biblical Theology”? Olinger explains how the new field of Biblical theology which began in the 18oo’s sought to drive a wedge between itself and systematic theology. But Vos, as a biblical theologian, stood in the gap and fought for the legitimacy of both forms of theology. Chris also asks how Princeton deteriorated into the unbiblical muddle it’s in today. Olinger explains how Vos and B. B. Warfield were the best of friends, and how Warfield even died of a heart attack in Vos’ front yard. There was an election for a president near the end of Warfield’s life, and Warfield lost by a slim margin to a Baltimore minister named Stevens. Stevens sought to broaden Princeton into something more than a seminary, and this began the decline. Warfield attended the first faculty meeting after Stevens was elected, and was so disgusted with him that he never attended another faculty meeting. Machen took over Warfield’s position after his death and immediately began to attack Stevens. Olinger relates a fascinating history of how Machen and Vos fought a loosing battle with liberalism that eventually destroyed the glory of Princeton. Olinger also talks about how doctrine and life goes together, and how Vos opposed the ideology that “doctrine divides but practice unites”. These two interviews with Olinger are a joy to listen to and will enlarge your understanding of theology and recent church history.